The area covered by umbra is the most spectacular from a whole solar eclipse phenomena, therefore I would like to pay particular attention to this. Because I was watching the totality only once, I am going to use some supporting materials next to my own pictures. What does the lunar shadow shape looks like? 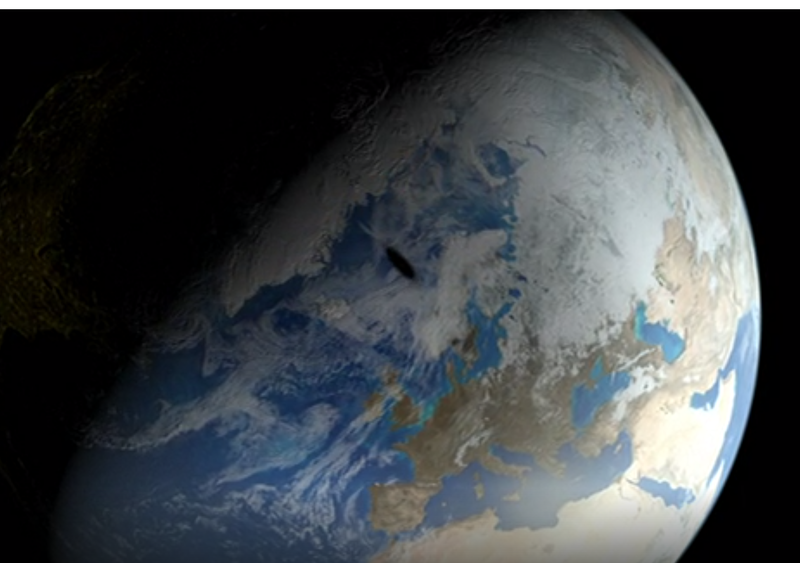 What does the lunar shadow looks like from the space? Is the lunar shadow edge sharp or gentle? What does the sene inside the shadow looks like? How can we recognize a prenumbra appearance without looking on the Sun? What things modifies the umbra appearance? What improves or impairs an umbral edge? Every celestial body cast a shadow, because it blocks an indicent light source on its way towards the space. For sake of simplification we can say, that this shadow extends into infinity, being expressed as a common light level drop by illumination source. Nowadays a lot of deep space observations concentrated on an external planet research is carried out on the basis of light drop from some particular star. It means, that when some star is blocked by unknown planet, an instrument such a hubble Telescope is inside a something like a half-shadow, produced by this unknow planet. An analoguous situation occur during the transits of internal planets across the solar disk as seen from the Earth. A popular kind of observations is the occultation of stars by small asteroids or Moon, when these remote objects loose their light for a brief moment. In Earth conditions the major culprit of both occultation and a significant daylight weakening is obviously the Moon – a natural satellite of our planet. The Moon is around 4 times smaller than Earth and around 400x smaller than our mother star an once. Because its average distance to Earth is 400x shorter than the distance of the Sun, we are lucky to experience an awesome total solar eclipse phenomena from time to time. I will stop this elaboration right now, bearing in mind, that these information are widely common in many encyclopedias, astronomy books and obviously in the web. Before I start to answer on the topic question I would like to say something general about the Moon’s shadow, possible to see during the solar eclipse. 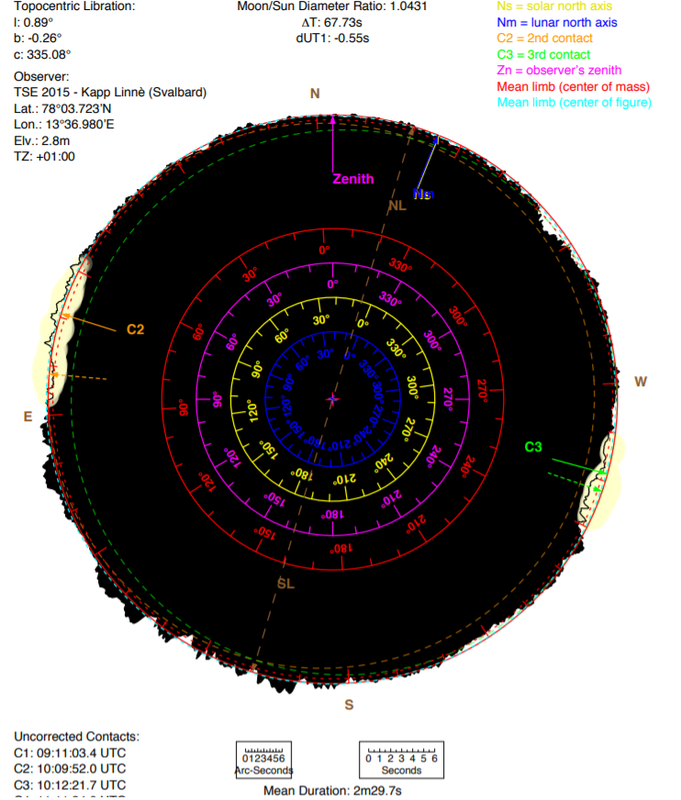 Prenumbra – with an extremely large 6000 – 7000 km diameter depends on the eclipse. The area covered by prenumbra is partially shaded. A degree of shading depends on the distance from the greatest eclipse. Due to this only a portion of the Moon is in front of the Sun. The area being inside the prenumbra witnesses a partial solar eclipse. Antumbra – this is the area of the shadow beyond the area of the umbra. The Moon is completely in front of the Sun, but doesn’t cover the entire Sun. The outline of the Sun (often called a ring) can be seen around the shadow of the Moon. When observer is located within the antumbra he can see the annular solar eclipse. The extremely big antumbra diameter can reach up to 374 km. 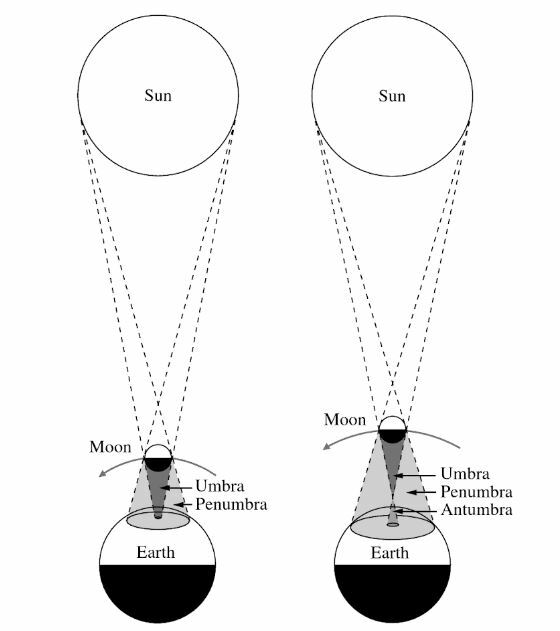 Umbra – is the portion of the Moon’s shadow, where the Moon completely covers the Sun. The umbra ends the shadow dark cone, which taper the Earth’s surface. The observer being inside the umbra is able to see a total solar eclipse. At the finish I will add up, that a maximum diameter for umbra is up to 273 km. Pic. 1 Types of lunar shadow, as seen during the solar eclipse. Important is, that when Moon is closer to the Earth, the prenumbra surface is smaller (eclipse2017.nasa.gov). Pic. 3 The lunar shadow during the 2017 Great American Eclipse and its relation to degree of solar disk coverage in particular location (Eclipse2017.nasa.gov). A first thing, that comes to mind is about a general shape of lunar shadow. Because we know, that Moon is spherical (for sake of simplification, because the same like another big bodies of the Solar System the Moon is a oblate spheroid) the shadow should have a circular shape. However this is an ideal assumption, when totality occurs at zenith. – A lunar distance to the Earth at the moment of eclipse (Pic. 1), which determine not only a prenumbra diameter, but also a width of the antumbral or umbral regions. The diameters mentioned above refers to thier maximum value as can be reached during the most favourable circumstances (when eclipse occur at the moment of apogeum whilst the Earth is in perihelion or other way round). – An eclipse phenomena location on the sky. When refer to these maximum values mentioned above we have to bear in mind, that they are valid only for zenithal type of eclipse. Practically it happens very rarely, when eclipse occur exactly at zenith. Usually Sun is located lower on the sky, therefore these values, what goes without saying, are going to be bigger. I promise to explain this issue more roughly in the future. – Local circumstances, that are much different between an opposite parts of the umbral region. Usually the extreme areas of umbral region are quite close to each other during the totality (usually about 100 km or more), although it still makes a difference in the solar position on the sky. Imagine, that each 111 km towards north or south changes the solar altitude on every 1 degree. A similar changes are to be observed when moving tens kilometers in eastern or western direction. When eclipse happens close to zenith is not a big deal, but again, it happens very rarely. When Sun is lower (further from zenith), then the local circumstances between an opposite parts of the umbra varies more. In the result we can observe on the eclipse maps and movies, that umbral shape is oval (looks like an ellipse) (Pic. 6). It is easy discernable, when eclipse occur near the terminator line, such a 2015 total solar eclipse at North Atlantic region (Pic. 5). Pic. 5 An oval shape of umbra as seen during the 2015 total solar eclipse at North Atlantic. Watch full movie here. (Svs.gfsc.nasa.gov). Pic. 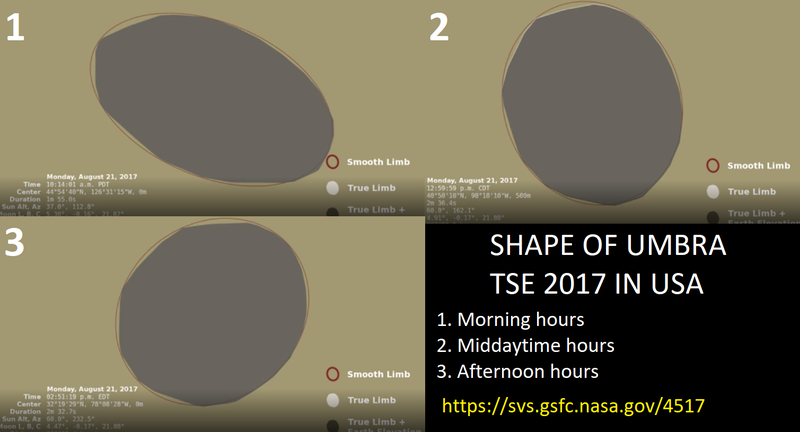 6 An umbral shape generated for 2017 Great American Eclipse circumstances. As you can see it changes as the solar position on the sky changes throughout the day. Watch a full movie here. (Svs.gsfc.nasa.gov). So now, you have got an answer for a 1st question, marked at the beginning of this article. Lunar shadow fleeting across the Earth surface during the eclipse looks like an ellipse. The eclipse maps have depicted the lunar shadow as a smooth ellipse on the ground for centuries. 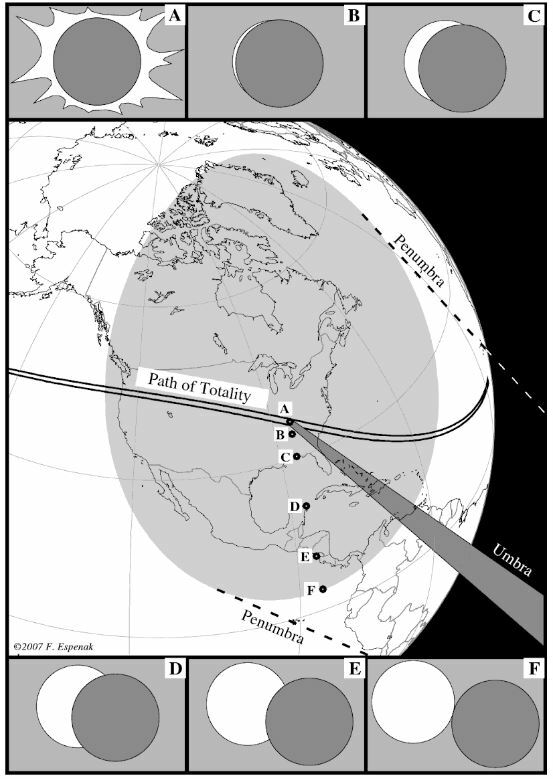 The umbra ellipse is various all the time throughout the solar eclipse. Imagine, than just after the moment of first touching the Earth’s ground by umbra this ellipse is very elongated. As the lunar shadow progress further on its path this ellipse become more smooth, reaching the most gently appearance at the greatest eclipse point. Thereafter the umbral shape changes in reverse sequence until it coincides with terminator (horizontal solar eclipse). This is an obvious astronomical factor arising out of the lunar movement around the Earth, which will be described with more details in the future. – a lunar limb profile (Pic. 1), which determines the real umbra shape borders. A lunar limb profile is different for each eclipse. It determines basically an exposure of lunar surface terrain declivity, as we can see from the Earth. Basically this is a minor thing for umbral shape during the eclipse, which is dramatically elusive. The difference between a smooth limb being an a mathematical reference and true limb, including the lunar topography (Pic. 6) is too small for our further considerations. Moreover the rough umbral borders are fuzzy and rather impossible to point, due to light scattering. A lunar limb profile is much more improtant for Baily’s Beads observation and diamond ring effect purposes (Pic. 7), because each edge corresponds to a single valley on the lunar limb. These things I will describe in the future. – Earth topography, that as well as a lunar limb profile modifies a shape of the umbra, but also not much. I could say, that this factor can be negligible, even if we have a high mountains, I think. On the other hand, it can be more important for Baily’s Beads observation, when an observer is placed within grazing zone, but this is a not a thing to looking at in this article. Usually the difference between true limb and Earth surface alterations is much smaller, that difference between smooth limb and true limb (Pic. 6). – Earth atmosphere, which includes a lot of air molecles, scattering the light as well as cloud coverage, that can also modify a shadow shape, but only locally and for a really short period. Describing an appearance of the lunar shadow I will follow the direction from the top to the bottom. Firstly I show you how it looks from the space then, next from the atmosphere (meteorological baloon and plane) and finally from an observer’s perspective on the ground. 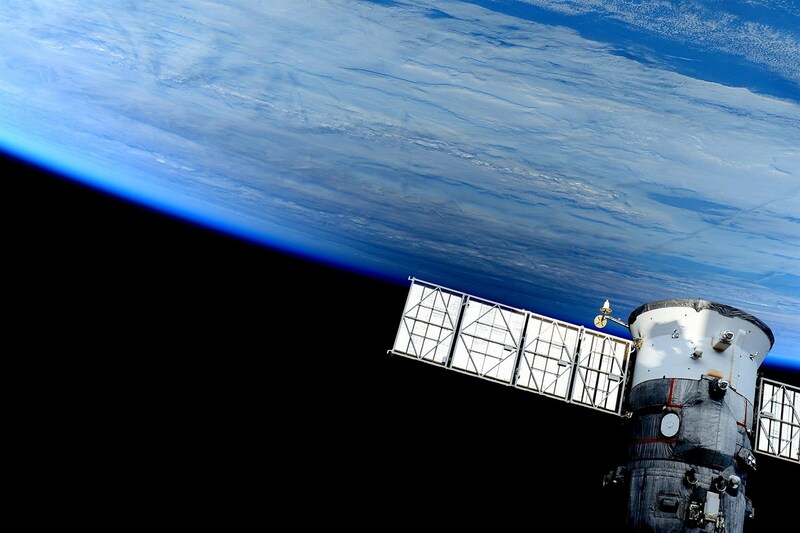 View of the lunar shadow from the space or atmosphere is the best, as you can witness. Everyone knows, that this is hard to achieve. The view an umbra from the space is reserved for ISS workers only, however a view it from the Earth’s atmosphere is concievable. We can raise a meteorological balloon or book a flight alongside the path of totality. For people keen on seeing the shadow from the space a good alternative is taking the look on weather real-time satellite imagery, which often record a umbral movement (Pic. 11). An ISS astronauts are able to see the lunar shadow quite easily, because usually ISS track passes the eclipse path usually 2-3 times on its route around the Globe. 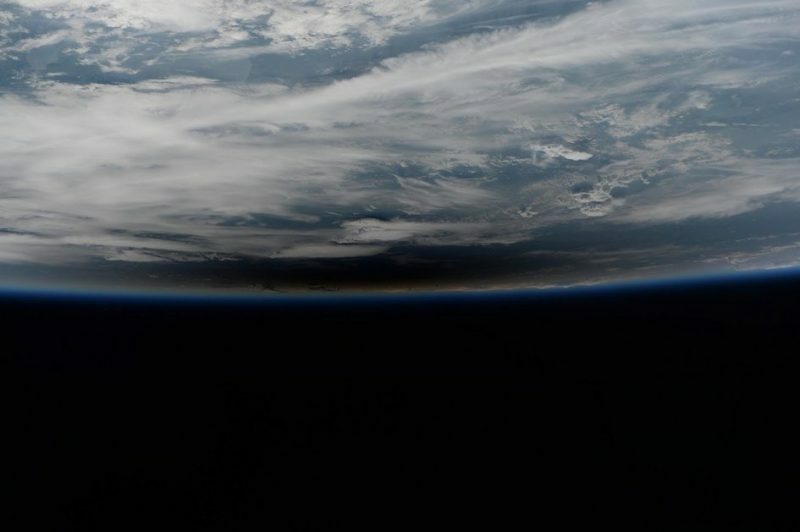 It must be a miracle for ISS to encounter a full shadow on its way, however umbra can be seen from the space station deck. It works thanks to the ISS altitude (about 400 km above ground), which gives it a range of view up to 1709 km. In the result the fully shadowed fragment of Earth can be seen in a lot of cases, when ISS crosses the area of eclipse. In majority of cases a prenumbral area is clearly visible too, even when a full shadow is completely gone or out of range (Pic. 8). Pic. 8 A prenumbra captured from International Space Station during 2015 total solar eclipse (credits: Samantha Cristoforetti). Neverthelles for us the most interesting view is the deep shaded area during of total solar eclipse (Pic. 9 – 11), which has been spotted by astronauts in different confogurations against the location of space station. Pic. 9 A full shadow of Moon captured from ISS on 21.08.2017 (credits: Paolo Nespoli, Earthsky.org). Pic. 10 An umbra captured by MIR on 11.08.1999 (Cnes.fr). Looking on these two images above you can spot, that an umbra doesn’t hase a clear border. Moreover the area inside the umbra looks completely dark. If you have seen a total solar eclipse before, then you know that’s impossible to get completely dark during a full phase. I will explain it further in this article. 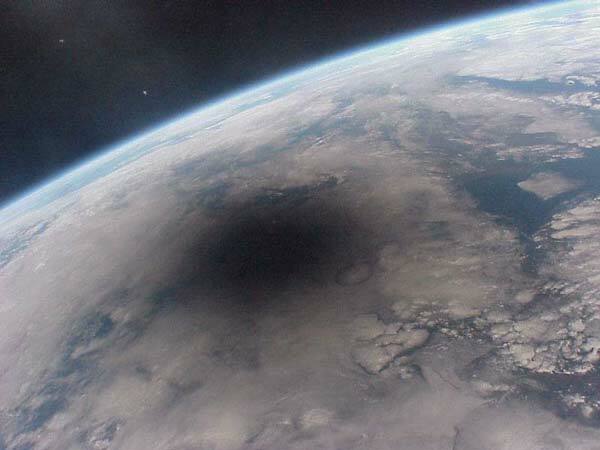 From the outside perspective the shadowed area looks completely dark, because a light reflected from Earth’s surface, which is outside the totality is much stronger, than light scattered by atmosphere inside the umbra. Apart from a full shadow itself, there is much wider area of prenumbra, experiencing a partial phase of the eclipse. This area encircles an umbral region, making the grey appearance with light fainting down towards the full shadow. The light drop caused by eclipse is also pretty good noticeable from the space, where a range of view aften covers an area free of eclipse or at least area with smaller obscuration. Anyway a prenumbral area is much better expressed, when a full shadowed area is outside of the field of view (Pic. 8). This is related to the light transition phenomena, which has been roughly described here. The grey area surrounding umbra become better visible also in situation, when the view range increases. Eventually it also appears to look black next to the umbra making the lunar shadow bigger in appearance, even when annular eclipse occur. This is easy to see on weather real-time satellite maps (Pic. 11), where even at the annular eclipses the dark area is easy to spot. The human eye perception makes umbra dark along with surrounding area illuminated by a thin crescent sun only and also antumbra. In the consequence is really hard to draw the border between shadowed and illuminated area. Looking on the umbra from the space we can see the circle-looking shape unlike to horizontal eclipses, when the lunar shadow appears to be elliptical. A similar view take place from a meteorological balloon (Pic. 12), where a view range is still much wider, than umbra width and external, sunlited areas bring a huge amount of light, beating up any brightness coming from the inside of umbral area. Pic. 12 A lunar shadow seen from the meteorological balloon, reaching the altitude about 36 km above ground (Apod.nasa.gov). As the altitude is reduced, we start to see some details on the ground inside the shadowed area. It is driven by shrinking view range, as we are on lower level. The amount of light, coming from partially eclipsed areas (while an atmosphere also) is weaker, because the umbra starts to play a leading role in the field of view, making a light transition phenomena at once. I think, that the light transition in this case should occur somewhere between altitude 20-30 km above ground. However it varies due to a lot of factors, related especially to the lunar shadow and the length of total solar eclipse. 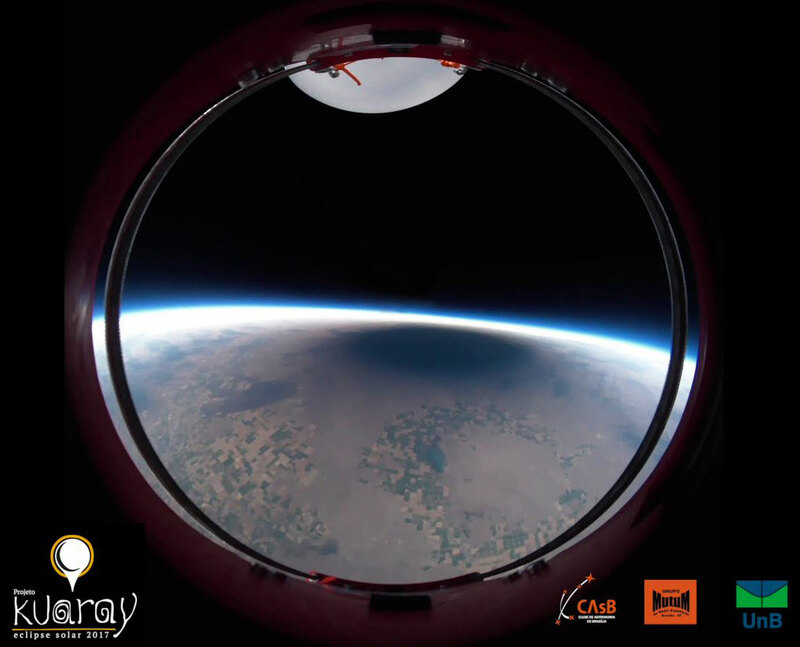 I believe, that over the next few years we will have much more pictures of lunar shadow from these altitudes, because the observations done through a meteorological balloon are getting popular. 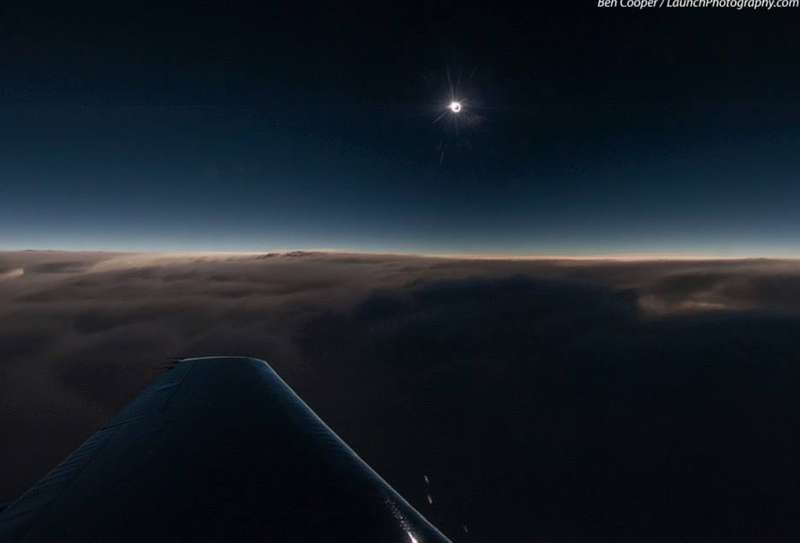 Is worth to mention about another, very spectacular situation, which was a chasing the total solar eclipse by concorde plane. It took place in 1973, when the longest record of totality watching (74 min) bounded by extended second (7 min) and thirn (12 min) contacts (Beckam et al., 1973) has been set. The umbra has been caputred from altitude varied between 16,2 and 17,7 km above ground (Beckam et al., 1973) (Pic. 13) and this observation nas not been repeated so far. Pic. 13 Lunar shadow seen from the Concorde deck, around 17km above ground on 30th June 1973. This eclipse lasted over 7min, so an umbra was big (Youtube.com). Watch a full movie at the bottom. 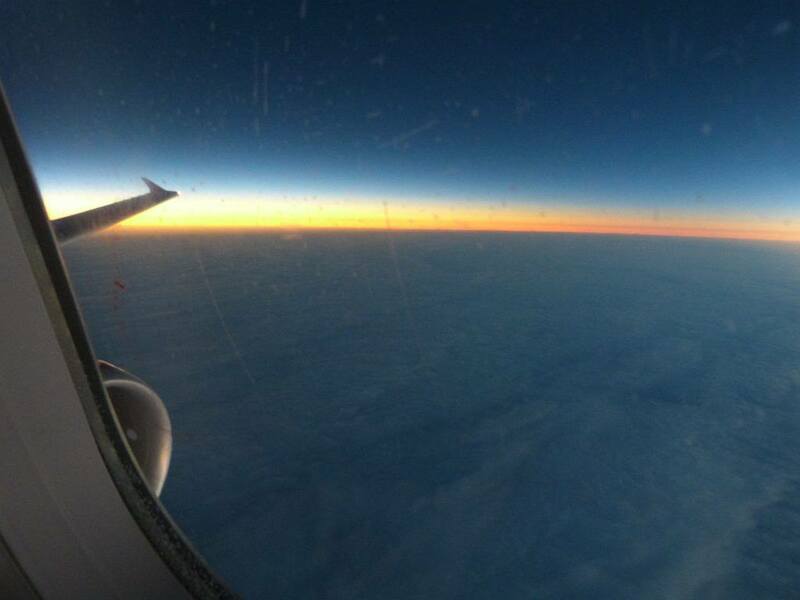 Now take a look on the view, that we can experience more often, namely through an eclipse flights. 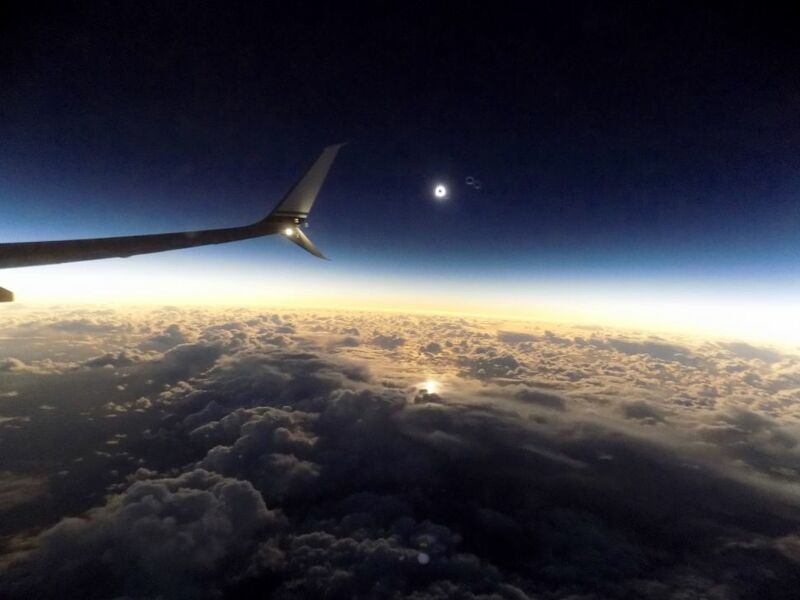 Some eclipse flights are organised and they are aimed at watching this phenomena from the cruising altitude, which is at about 10-13 km above ground. Sometimes the plane can fly a bit higher, up to 15 km, like Xavier Jubier did during the 2015 total solar eclipse, organising 3 falcon 7X XMJ aircraft for this occassion (Stevens, 2016)(Pic. 14). Pic. 14 A totality with lunar shadow underneath captured by Xavier Jubier members from about 15km altitude (Youtube.com). 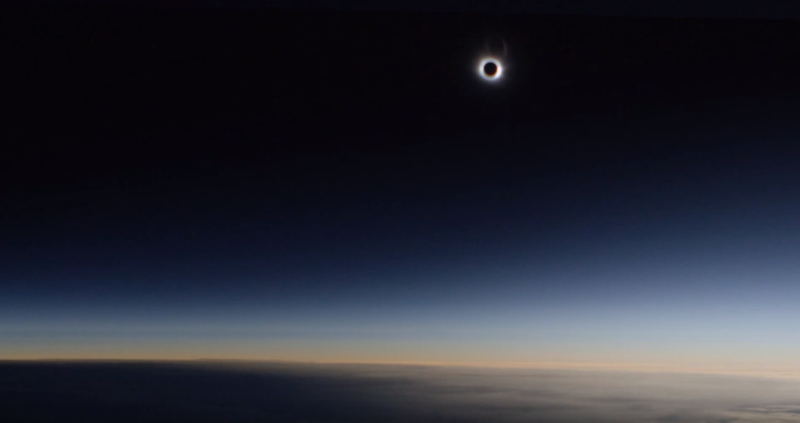 An eclipse flight bring another advantage, which is a longer time of totality. The umbra fleets with about 4.5 Ma velocity, whereas a commercial craft can fly up to 0.85Ma. This is about 1/4 speed of lunar shadow, so the eclipse can be extended up to 25%. This is an issue, which will be developed in the future. I would like to bring some examples of umbral view from the typical cruising altitude, done on 20.03.2015 below (Pic. 15-18). Pic. 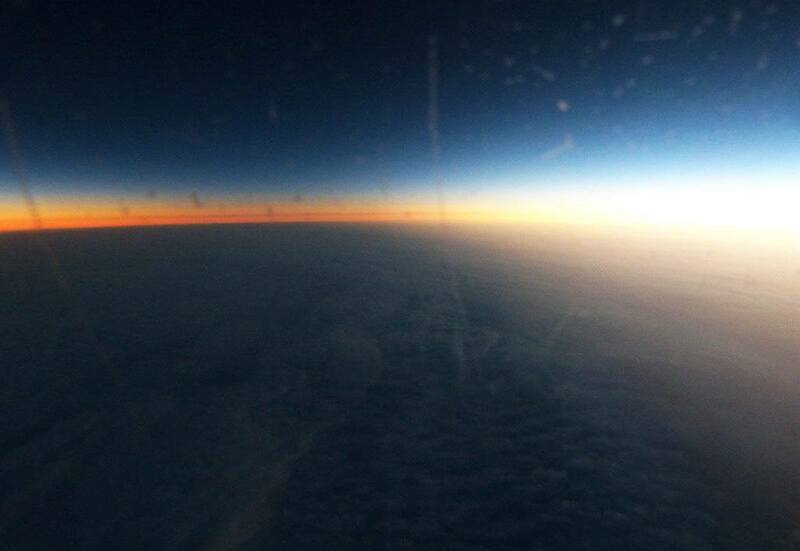 15 – 18 A lunar shadow seen from typical cruising altitude somewhere above North Atlantic, done by Daniel Fisher, who was a member of the Travel Quest (TQ) eclipse flight (credits: Daniel Fisher). Watch a full movie at the bottom. There are another reports, but again, I will raise an another post regarding this in the future. For the time being I show you an Alaska Airlines example (8.03.2016) (Pic. 18) and the most spectacular – almost hybrid, taken by Been Cooper on 5.11.2013 (Pic. 19). Pic. 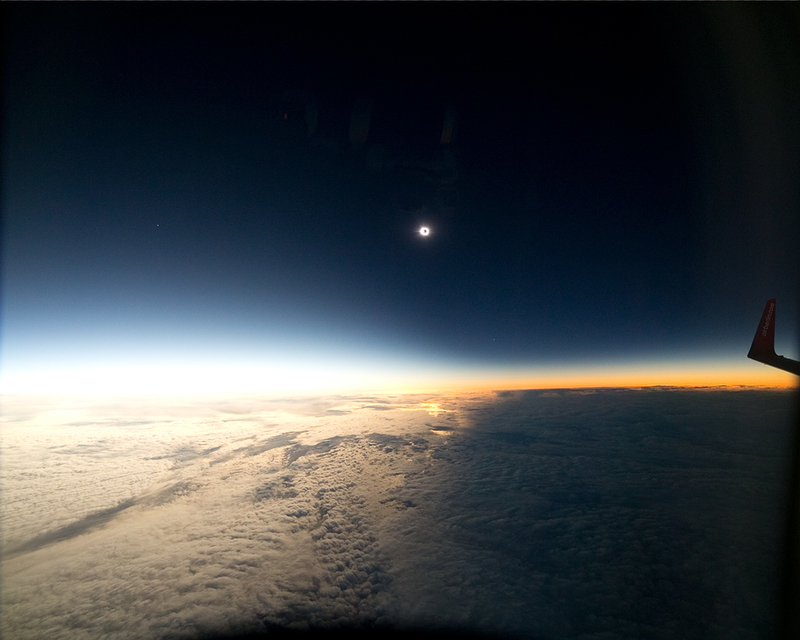 19 The total solar eclipse of March 8, 2016 seen from Alaska Airlines flight no 870 above Pacific (credits: Joe Rao/ Space.com). Watch a full movie at the bottom. Pic. 20 Total? 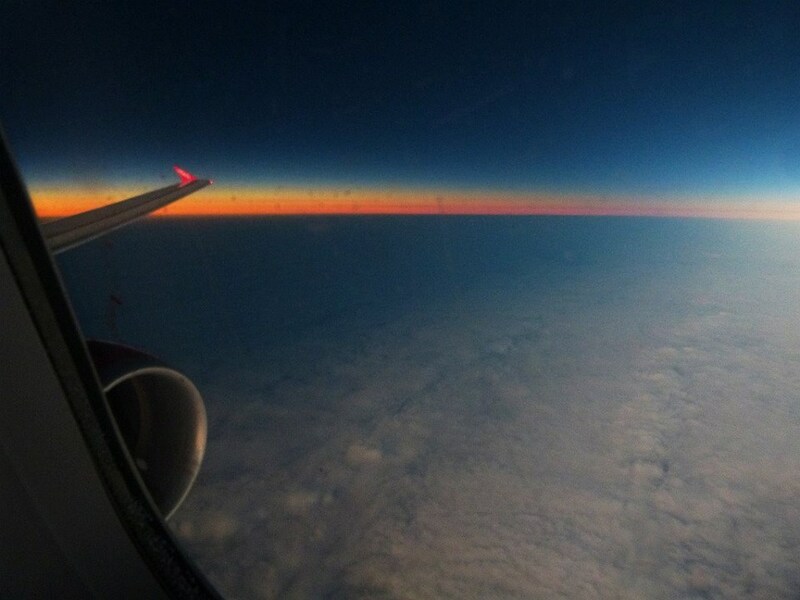 (or Hybrid) solar eclipse captured from the plane on November 5th 2013 (credits: Bec Cooper/ Launchphotography.com). See an original image here. There aere also known images and footages of the lunar shadow captured from the mid-level or low level cloud deck (Pic. 21, 22). Pic. 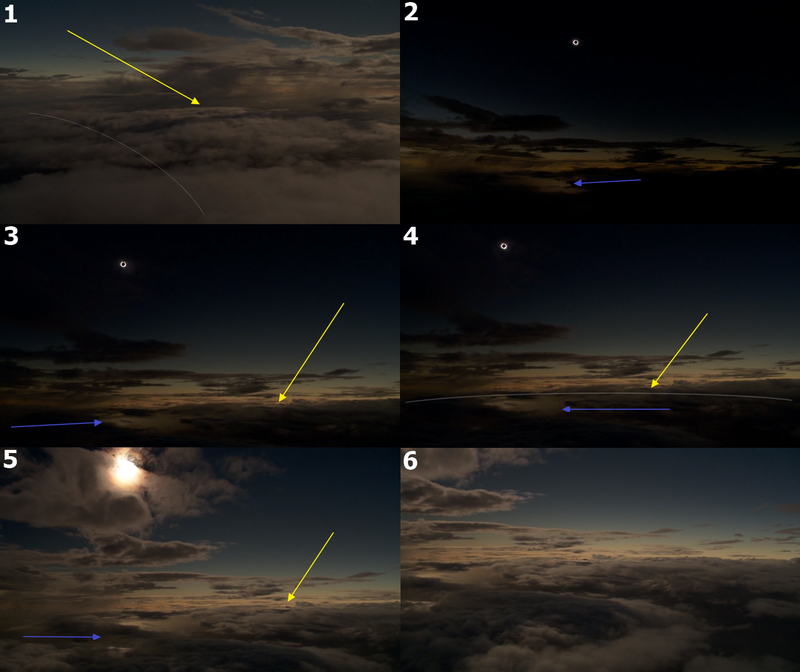 22 A video captures of prenumbral impact on the light reflection on the low level clouds shifting above the Isle of Lewis (UK), where greatest phase of 2015 solar eclipse reached 98%, where: 1,2,4 – darkening cloud deck caused by sunlight decrement related to the directions of light scattering; 3 – a lunar shadow column seen from about 170 km distance (credits: Youtube.com). Watch a full movie at the bottom. There is much more footages available on Youtube and another streaming services, where we can take a look on the phenomenas related to solar eclipse. It definitely requires an another post about this. Important is the question – from what altitude can we see a whole umbra shape? The answer is, that the mimimum altitude, from which we can see a whole umbra is various then. For the longest eclipse case, where umbra diameter can count up to 273 km it will be around 5 km above horizon. However this is only a mathematical assessment based on the trigonometric functions, because from practical point of view at altitudes greater than a few kilometers the horizon is indistinct because of contrast reduction, even on extraordinary clear days (Bohren 1986). Once eclipse is shorter, like last one in America this minimum altitude will be accordingly lower, although from practical point of view the shadow edges can be hide behind some mountain ranges, etc. Anyway the “safe” altitude, from where a whole umbra eclipse is to be visible is the cruising altitude (Pic. 15 – 18). An airplane passanger flying over an Earth’s surface cannot point the apparent boundary between earth and sky, but is high enough to see a whole lunar shadow shape on the ground. Both from the plane and the meteorological balloon we can see a fuzzy edge of shadow. This is a big contrast between the illuminated and completely shaded area. As our altitude is higher we won’t be able to see the details on the shadowed ground. This is due to the increasing range of sight the illuminated area, which blind the observer and making the shaded area in black apearance. Now let’s take a look on the lunar shadow, as it approaches and look inside. On all maps, animations and simulations the Moon’s shadow appears to have sharp, strictly determined borders. Does it looks the same in reality? The answer is: No! As I wrote above about a gently transition between illuminated and dark (or black) area, seen from upper part of the atmosphere and space, it is to be observed also on-the-ground reality. The best view of the lunar shadow from the ground can be reached on some elevated areas. The best places, however with the lowest probability of a good weather are high mountains. A view of the umbra can be pretty much similar to this, gained somewhere from the low level cloud deck level. 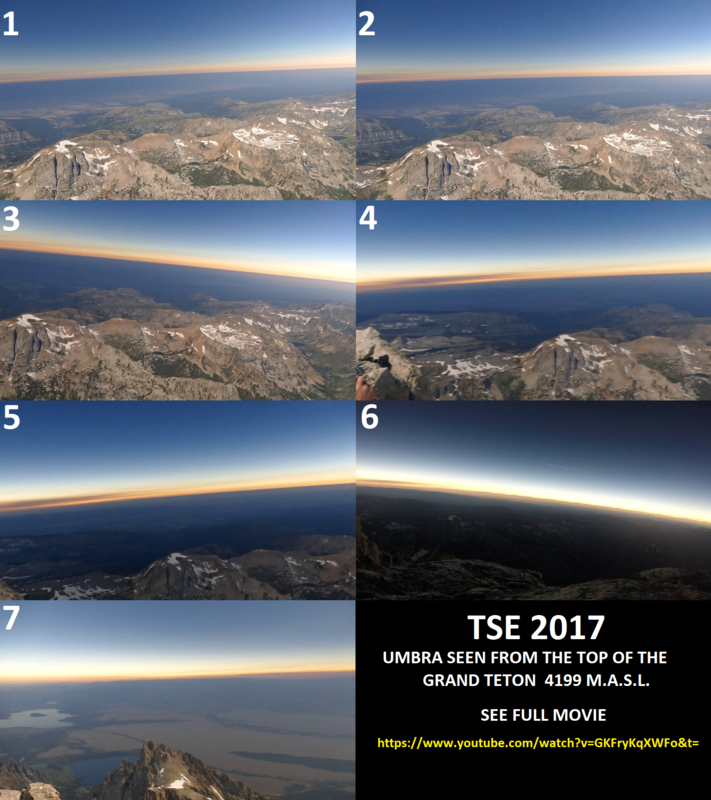 The best example, as we can see, comes from the group of mountaineers, who decided to observe the 2017 total solar eclipse from the Grand Teton summit. The experience was amazing, we can say, that they were extremely lucky, having a sky completely free of clouds (Pic. 23). Pic. 23 An umbra seen from the top of Grand Teton summit (4199 m.a.s.l), rising more than 2,5 km above surrounding area, where: 1 – 5 – shadow approach from north west (shadow-in direction); 6 – the moment of totality, 7 – shadow receeding towards south east (shadow-out direction). The shadow outline is quite good visible due to considerable altitude (Youtube.com). Watch a full movie at the bottom. The view from Grand Teton summit was jaw-dropped for everyone. Again, the favourable conditions for this kind of observation happens only rarely. Usually a similar, but less spectacular view an observer can get from lower mountains or some elevated areas, when your relative altitude is maximum about 1 km. In this event you won’t be able to see the shadow outline. Instead of it a considerable ground darkening is to be seen. The ground darkening express the irradiation level difference on the seen distance between an observer and some point at horizon. 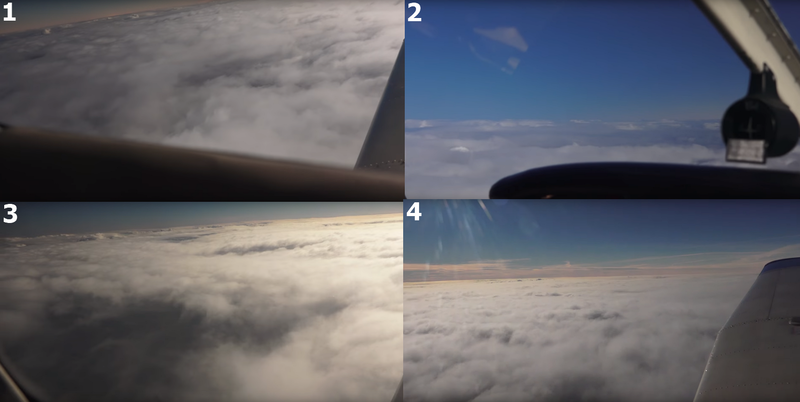 It is analoguous to cloud deck seen from the plane or helicopter, presented above (Pic. 21, 22). There is an example of the ground darkening below, related to the full shadow approach. As you will see, there is no sharp umbral edge. Everything goes through such a gently transition of light, which is being scattered during a first and last several seconds of totality. A shadow edge become more sharp, when is further from the observer due to the perspective effect. I have no example of umbral region seen from the elevated mountainuous area, but you can see a drone-perspective instead of it. This is the view, which I believe will be more popular in future eclipses (Pic. 24). Pic. 24 The umbra and ground darkening seen from drone perspective (above 300-400 m.a.g.l) near Madras, OR on 21.08.2017. The umbra edge is more sharp near the horizon due to perspective effect and light transition phenomena (credits: Mateusz Windak). As you can see both in the view from high mountain and from some elevated area, the edge of the umbra, despite on lack of sharpness, is general quite easy to determine for observer being on the ground. It can be hard to see the umbral edge when looking on a distant mountain ranges. Anyway the because lunar edge is not sharp, the border between the area illuminated by vanishing crescent sun and shadowed area is soft. This is because illumination decrement progress according to the logarythmic function, the fastest dimming of light is observed just before the totality as oppose to the fastest brightening just after 3rd contact. When observing the eclipse on the low and flat grounds, the best lunar shadow appearance is to be seen on the sky. However, is still possible to see some ground darkening phenomena, especially near the 2nd and 3rd contacts as well as shadow movement across the rough land, featuring some huge mountain ranges with relative altitude about at least few hundred meters. I was fortunate to capture the fleeting umbra on Owl Creek mountain range (Pic. 25, 26), located about 30-65 km from my observation venue. This range rise up to 1 km above the Wind River Basin. Pic. 25, 26 The umbra edge spotted on the Owl Creek Mountains range in Wyoming on 21.08.2017 from the PTMA observation venue. In the image below a grey arrow shows roughly the border of lunar shadow. See an original image here. This observation doesn’t work when hills are too low or lies close to the observation venue. In effect near the 2nd or 3rd contacts an observer will see, that some hills are plunged in the shadow, whereas another ones are still a bit illuminated (Pic. 29). Lunar shadow is easily seen on the sky, even when total solar eclipse doesn’t take place in particular location. However this situation apply to deep partial solar eclipses, when obscuration is higher than about 86% under the transparent atmosphere, free of haze. The lowest magnitude, when I could spot an umbra on the sky was 0,9 (Pic. 27). It was in 2015 in Scotland. I haven’t repeated a view such this in 2017 due to high haze concentration in Wyoming. Pic. 27 An receeding umbra seen on the sky during 2015 solar eclipse in Scotland, when obscuration was 89% (green arrow, upper image). A few minutes later, it was no longer visible. Exposure: 1/25s. Click to enlarge. The obscuration of 86% (magnitude about 0.88) is a moment, when shadow geometrically begin visible above horizon, taking into account the altitude of ozonosphere, which response we can see twice a day as a civil wedge, being a border between he belt of Venus and Earth’s shadow. I will describe this phenomena in the future, although for the time being it’s good to know, that the altitude is about 27-28km, which correspond to 6 deg horizon dip (an civil twilight border). With respect to total solar eclipses we can see a similar phenomena, expressed by abrupt sky darkening (Pic. 32-35). In practise is impossible to spot the umbra at this stage of eclipse, because there are factors, preventing it appearance, like haze concentration and irradiation itself. Neverthelles, when phase of eclipse is greater, the shadow may start to be present on the lower part of the sky. It still can not be a full umbra, but an area in its closer vicinity, featuring a sudden light drop, as we observe a tens seconds before the totality. Considering the irradiance weakening towards the umbra, the haze will impair it, making the umbra a bit longer invisible, as the eclipse progress. For the eclipse magnitudes, smaller than 0.88 an umbra won’t be visible, but under favourable conditions the observer will be able to spot a slight sky darkening as an result of deep prenumbra presence. 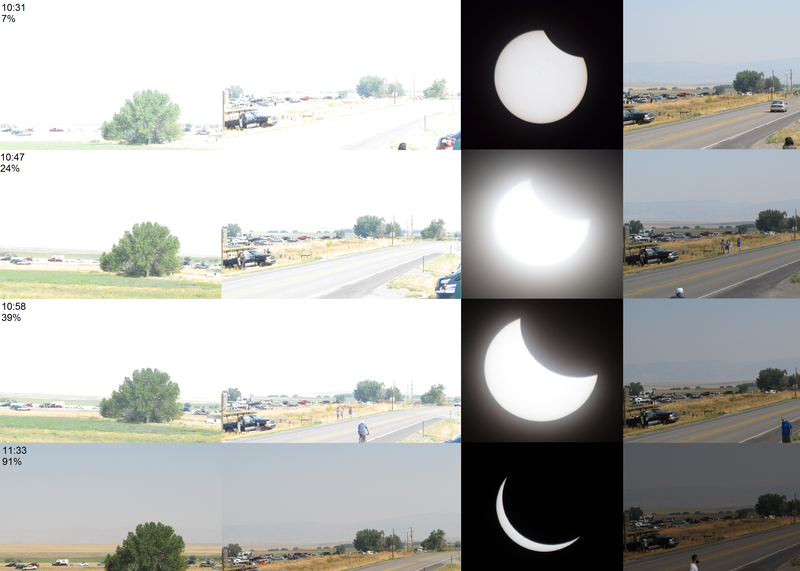 In Wyoming at the eclipse day, a thick haze unabled me to see the umbra such “far” from the totality, as I could do in Scotland. Measuring the light I noticed a small light level drop at 0.89 magnitude (Pic. 28). The umbra started to be visible at about 0.95 magnitude, when was high enough on the sky to beat up the haze suspended in the planetary boundary layer haze (Pic. 29). Pic. 29 The earliest moment, when a serious darkening sky towards a shadow-in (north west) direction started to be visible – magnitude 0.93 (92% obscuration). Grey lines show the darkening section of sky. Riverton 21.08.2017. Pic. 30 The lunar shadow visibility at 0.95 magnitude. A grey arrows show a serious sky darkening towards the shadow-in direction (north west) (credits: Tomasz Rać). For bigger magnitudes there is basically no problem to spot a sudden sky darkening towards the direction, where total solar eclipse takes place (Pic. 31, 32). A person, who doesn’t have a clue about the solar eclipse phenomenas can see it from the distance about 250 km from the path of totality without the problem, especially under favourable geometric conditions, as occured on 20.03.2015 for some locations. Obviously it apply to transparent atmosphere, free of haze and consistently for antisolar direction, where backward scattering takes place. 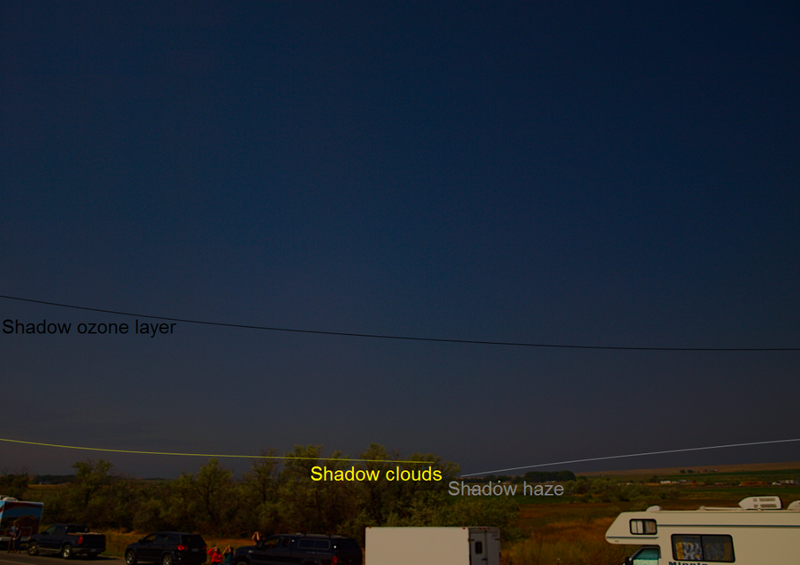 The minimum distance, from where umbra can be visible for observer is about 100 km in cases, when shadow cone fleets “under the Sun” on the sky, under high level of haze concentration such on 21.08.2017 in Wyoming. Pic. 31, 32 A lunar shadow column seen at the greatest phase of 2015 solar eclipse in north-western Scotland, 250km from the path of totality. 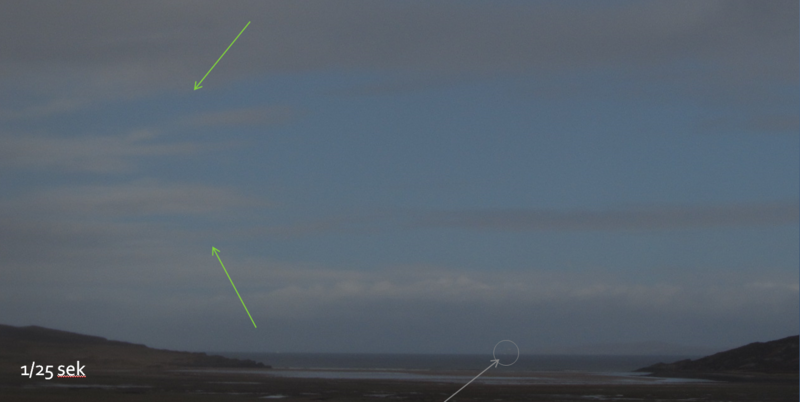 Green arrows show a sudden darkening of the sky, a grey arrow indicate the Stoer lighthouse, seen from about 30km distance, which light was stronger than sunlight at the peak of the eclipse. Upper picture exposure: 1/125sec. See an original image here. The best appearance of the umbral column occur obviously, when observer is as close as possible to the path of totality. Usually it take place for obscuration higher than 99%, when both sunlight is weak and distance to the umbra low (usually tens kilometers) (Pic. 33). Pic. 33 An amazing capture of the lunar shadow from about 40km distance (south east Iceland, 20.03.2015), where grey lines show the umbra and yellow line show a remote high-level clouds being shadowed by Moon (Youtube.com). Watch a full movie at the bottom. In that cases, sunlight is too faint to drown out the umbra appearance. Apart from this here is only a small amount of illuminated haze or atmospheric molecules between an observer and the shadowed region, so umbra has a dark grey instead of bluish appearance, as an oberver can see it from a bigger distance (Pic. 22, 30-32). In the Pic.33 the Sun was too low to produce a grey shadow cone, that should be visible under higher solar position, which has been described later in this article. An analogue view occur when shadow approaches from antosilar direction, as I could see during 2017 Great American Eclipse. Then you can easily distinguish a single layers in the atmosphere, being covered by umbra (Pic. 34 – 36). For sake of simplification these layers are: ozone layer (sky), upper troposphere (high-level clouds) and lower troposphere (planetary boundary layer). Pic. 34 Two separate shots os shadow approaching during the 2017 Great American Eclipse in Wyoming. It was about 30 sec before 2nd contact with shot by shot period difference, so imagine how quickly things go by during the solar eclipse! You can spot also a small ground darkening, looking just behind the white van. Exposure: 1/20s. Click to enlarge. Pic. 35, 36 – A lunar shadow present on each important level of the lower atmosphere: on the ozone layer (quite sharp edge seen on the sky), on the high clouds level (it easily distinguish shadowed and non-shadowed clouds) and on the haze (atmosphere boundary layer), which arleady is approaching, whereas previous two cses show an opposite side of the umbra, yet just before the totality. On the upper picture a shadow grey cone is to be visible, but less pronounced than under forward light scattering conditions. Dar arrow shows the commercial plane heading south east, possibly an eclipse flight. Exposure 1/20s. Click to enlarge. The similar situation takes place in the reverse sequence, just after the totality. Important is, where roughly shadow is heading to. In my observation case, when Sun was located at south east, that was pretty much the shadow-out section of sky, a shadow appearance was incredible. A light transition moment right after the total eclipse produced a perfect shadow cone appearance, which was looking intensively grey against the another parts of the sky (Pic. 37). This grey colour became brighter as the solar crescent was getting thicker. Everything lasts about first tens seconds after totality. Pic. 37 A deep grey sky as captured about 30s after totality towards ESE (shadow-out) direction. You can see the shaded min-level clouds just above the horizon. Exif: 55mm, 1/25s, f/5.6. A shadow cone captured by camera with fixed photo paramteters looks different than on snaps gathered from the footage, where ISO sensitivity adjusts effectively to the changing ilumination of the scene (Pic. 38, 39). Unfortunately both pictures from camera and snaps from footages cannot reflect a real phenomena, as the observer can see with the naked eye. Pic. 38 The light transition phenomena and greyish shadow cone appearance after the totality captured by 360 deg camera, cropped. (credits: Tomasz Rać). Pic. 39 The light transition phenomena and greyish shadow cone appearance after the totality, captured by dashcam (credits: Piotr Dzikowski). A shadow cone is visible due to the fleeting light transition dividing the air molecules still illuminated by crescent sun from those, arleady been shadowed. This expression is enhanced under hazy conditions, where light scattering conditions are more favourable. A key role here plays a forward scattering, which can significantly wash out an initial colour of the sky, making it very faint. That’s why the sky around the totality includes a lot of greyscale tints. A shadow cone is also visible at antisolar direction, especially under hazy conditions, however a backward light scattering doesn’t emphasize this phenomena as a forward light scattering does. Before I describe the situation, what happens inside the umbra I would like to show an umbra movement on clouds, as seen from outside of totality. Theoretically a shadowed high-level clouds we should see from about 380 km distance, knowing that they are suspended around 10 km above ground. Likewise with shadow appearance, the shadowed clouds cannot be visible from this distanse, because of a huge amount of light scattered on molecules and haze, which makes these clouds appearance fainter, according to Beer-Lambert Law. To see the umbra fleeting on the high-level cloud deck an observer must be at least about 150-200 km from the path of totality (Pic. 40). Think, from what distance are you able to see a thunderstorm cloud. It works pretty much the same. When atmosphere is clear, then this is possible, when is a lot of haze in the air, then this view from 80 km will be a miracle. In other case, this view can be gained from even 250 km distance. 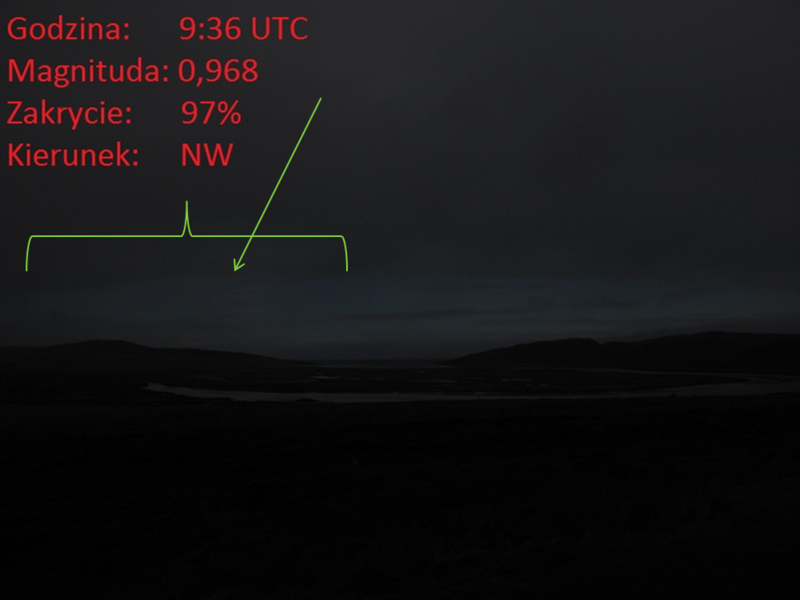 Taking into account the almost total solar eclipse as occured on southern Iceland on 20.03.2015, the umbra fleeting on clouds was seen from almost 200 km distance! Air masses coming to Iceland from north or north west are very clear, that is the reason. It’s worth to know, that even, when the full shadow is out of range, the high level clouds clearly shows the difference in illumination within a deep prenumbra (Pic. 40). It can be seen much further from the area, where a totality is expected. Pic. 40 An spectacular lunar shadow movement across the cirrostratus clouds as seen on Iceland on 20.03.2015 from about 150 km distance (upper image) and even more than 180 km distance. 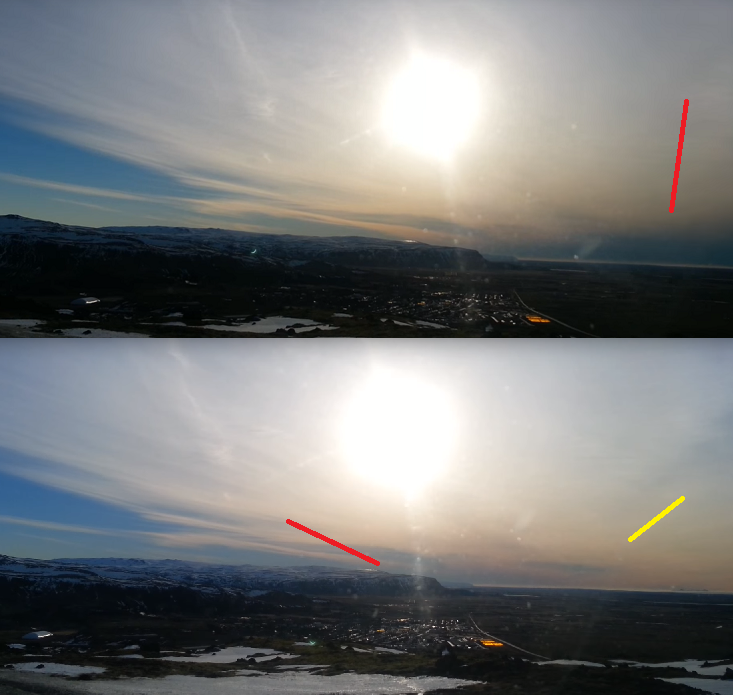 Red dashes show a full shadowed clouds, whereas yellow dash indicate a deep prenumbral area, that turns the cirrostratus colour into orange (Youtube.com). It won’t work for mid-level and low level clouds, upon you set at least tens km from the path of totality. On top of that, on these level of clouds umbra is more elusive. When you are set on the path of totality, sooner or later you will be inside the umbra. The view of lunar shadow from the inside is much different, than we can see being outside from the totality. First of all, this is a different relation of illumiantion. When outside the lunar shadow we have got a primary light source, which is the Sun and there is no another illumination source, which can be stronger (except for instance some street lamps, that has only a local, minor impact). An inside, the situation is other way round, especially, when you are in the middle of the shadow. Then you often experience more than primary illumination source, which is a light scattered in the atmosphere. Saying primary illumination source I mean not a point illumination source, as the Sun is, but something like a block illumination source, which correspond to entire section of sky, giving a diffused radiation towards the observer. Another key thing is a light transition, which happens around 2nd and 3rd contact. It turns a shadowed area from the “grey abyss” into a clearly visible twilight sky and other way round at the end of totality. As you may have noticed i.e on Pic. 33-36,40 there is basically no visual information from the “inside” an umbra, because the scattered light is drown out by direct light, coming from the Sun onto prenumbral region. Being in the umbra both internal and external area is clearly visible, analogically to civil twilight, about which I will write more in the future. In the sequence below you can see step by step how the lunar shadow moves across the sky, clouds and haze (atmosphere boundary layer) (Pic. 41,42). It’s clearly shown, that depends on the altitude, against the observer in cojnunction with the stage of totality, the umbral appearance is slightly different. Returning to umbral movement seen on the hills, the closer and smaller butts case have been mentioned. The most improtant thing, that you can see there is the brightness. As I said previously, that inside umbra a vista remains the civil twilight conditions. You are still able to clearly see the items around you and even read the book! However it can be quite tricky, especially when font is not big enough. 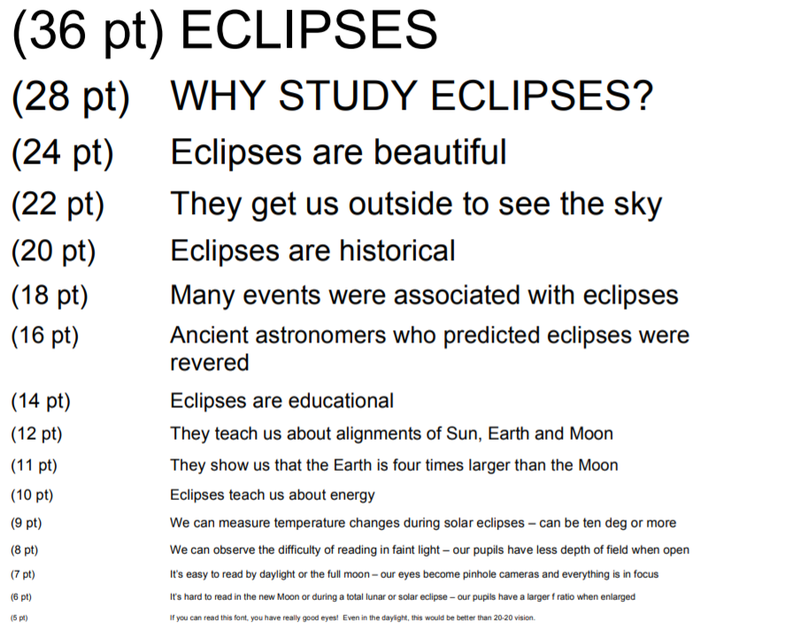 There is an Eclipse Reading Chart, prepared by Rice Space Institute, which provides a lot of font sizes, being readable during the partial phase and totality (Pic. 44). Everything depends on the totality length, umbral depth and weather. These 3 major factors determine ability to reading text when total solar eclipse occurs. Moreover inside the umbra you can also experience a shifting illumination source as the eclipse progress, what you possibly can spot in the picture sequence below. This phenomena has been arleady explained here. Pic. 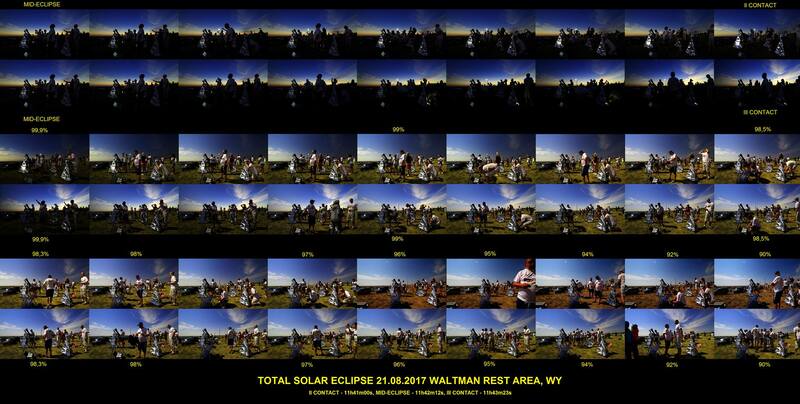 41, 42 A shadow movement across the observation place during 2017 total solar eclipse in Wyoming. Pic. 42 shows the umbral borders on particular altitudes, where: blue – sky (ozone layer), yellow – high level clouds deck, black – planetary boundary layer, green – possible umbral edge on the ground. Chasing the shadow on closely located hills can be a tricky issue. Look also on the ground and its response on the main illumination source (credits: Mariusz Marand Wiśniewski footage). Pic. 43 An Eclipse Reading Chart prepared by Rice Space Institute, that measures our ability to read the text during the totality, inside the lunar shadow and also inside the prenumbra. This is a good test to check your sight from the beginning of the eclipse down to the greatest, total phase. In another footage we can see a simetry between the greatest phase of the eclipse. It covers both totality and deep phase of eclipse from magnitude 0.9 upwards (Pic. 44). This simetry can be gained, when your camera is headed towards one fixed direction. In this case it was close to shadow-in direction (north west). Pic. 44 The simetrical moments of the 2017 solar eclipse captured by camera by PTMA members (credits: Marek Substyk). Interesting is a view of lunar shadow movement in the negative colours (Pic. 45). Pic. 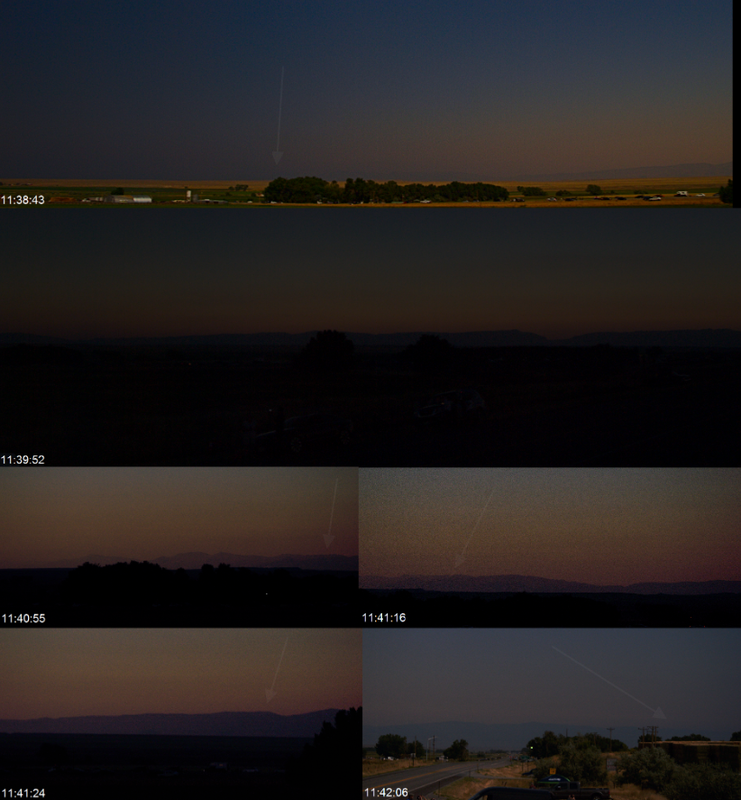 45 An image sequence of lunar shadow crossing the sky during 2017 total solar eclipse near Riverton in Wyoming. A blue negative colours show perfectly the umbral borders as seen towards shadow-out (south east) section of sky (credits: Piotr Dzikowski). Click to enlarge. Apart from footage shots, which feature the ISO sensitivity changes throughout the eclipse event I prepared also a panoramic photos from inside of the umbra, that has been done with fixed parameters: 1/20 sec exposure and f/4.5 aperture (Pic. 46). Pic. 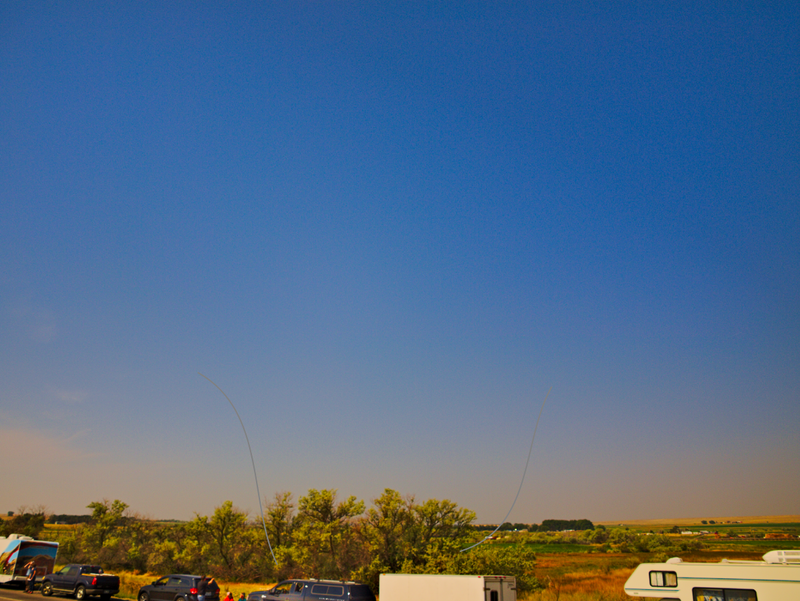 46 A sky view during 2017 totality near Riverton in Wyoming. Exif: 14mm, 1/20s, f/4.5 (enhanced photo). Pic. 47 A sky view towards the eclipsed Sun on 21.08.2017 near Riverton in Wyoming. The leftmost image is an original, another has been enhanced. We can clearly see an light scattering effect on the bottom of cirrostratus clouds, being close to the umbral edge. Exif: 14mm, 1/20s, f/4.5. 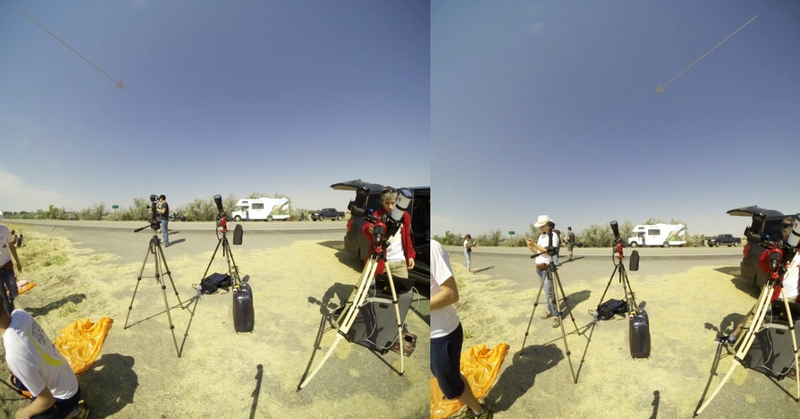 The best way to capture a whole sky during the eclipse is using all sky camera or at least fish eye perspective (Pic. 48). Having a view of entire sky, we can roughly see how the umbra looks like at the particular moment of the eclipse. 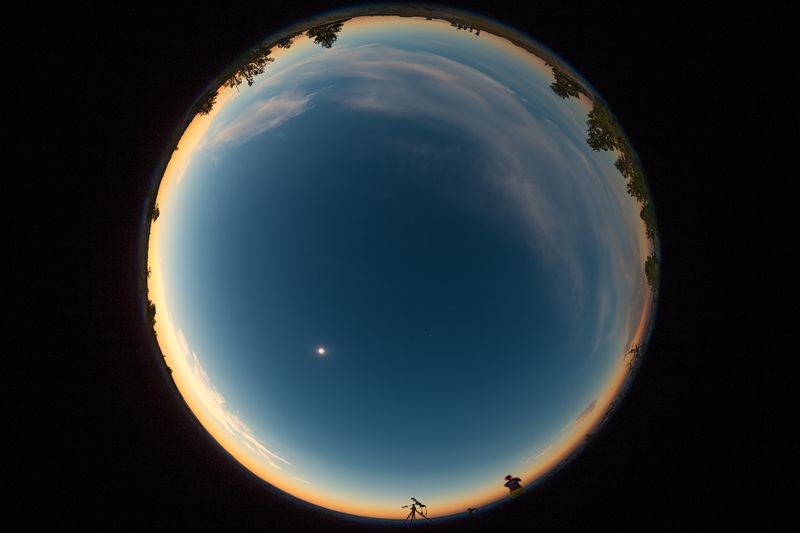 A fisheye view of the sky during the total solar eclipse of August 21, 2017. Using all sky pictures to capture the total solar eclipse penomena is a good way to display a lunar shadow geometry, which varies primarily due to Sun altitude. That’s an separate matter, which will be described in the future. 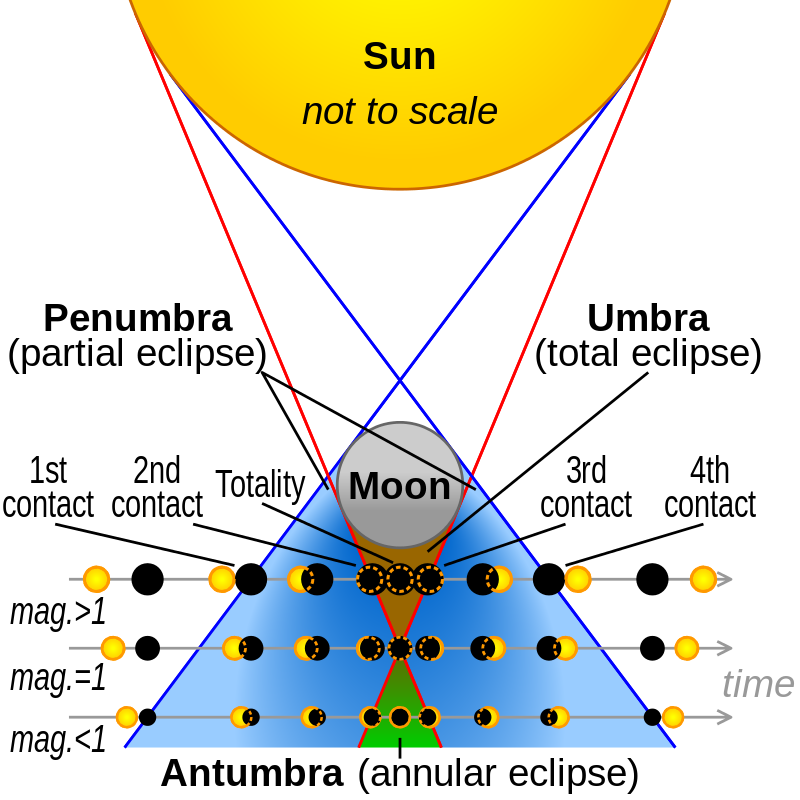 Except of umbra, which view is one of the most spectacular during the solar eclipse for sure, much more observers experience a prenumbra appearance. It apply not only eclipse chasers but also a casual people seeing this phenomena far out from the biggest phase. Previously I have focused on prenumbra only, when magnitude is very big and we experience a deep phase of the eclipse, when umbra is visible for observer. Now I would like to show general, how the illumination changes throughout a whole partial solar eclipse phase. As lunar disk progress across the Sun, we can see an illumination changes. The truth is, that lots of people doesn’t realize, that the radiation changes. The reason of it is the same illuminaton decreasing both for sky, surrounding vista and illumination source. A human eye adapts to the “new” conditions then, neverthelles of the eclipse magnitude. It changes usually, when eclipse phase is deep enough and primary illumination source can be compared with some fixed light available nearby. The illumination changes can be recorded easily with fixed exif parameters, even from the early stage of the eclipse (Pic. 49 – 51). Pic. 49 Illumination level changes during partial phase of 2017 total solar eclipse – view towards Owl Creek Mts. Exif: 1/25s f/4.5, 12x zoom. Pic. 50 Illumination level changes during partial phase of 2017 total solar eclipse. View towards shadow-in (WNW) sky. Exif: 18mm, 1/125s, f/5.6. Pic. 51 Illumination level changes during partial phase of 2017 total solar eclipse. View towards shadow-out (SE) part of the sky. Exif: 18mm, 1/640s, f/5.6. A slighlty different result we can gain, when record a light level drop with a flexible ISO sentitivity. Even here, the changes are noticeable at the early stage of the partial phase of eclipse, although these changes are more expressed with sky tint instead of light drop itself (Pic. 52 – 54). Pic. 52 A photo sequence of illumination changes throughout a whole partial phase of 2017 solar eclipse, made by vertical snippets, where 1 snip correspond to 1% obscuration changes (based on Bartosz Wojczyński timelapse images). See an original images here and here. Pic. 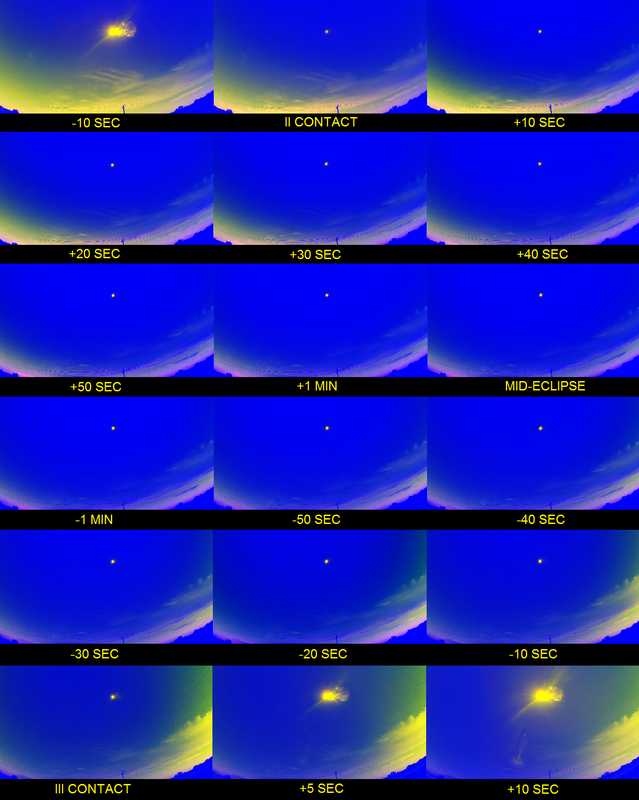 53, 54 – A photo sequence of illumination changes throughout a whole partial phase of 2017 solar eclipse, made by vertical snippets, where 1 snip correspond to 1% obscuration changes (based on Bartosz Wojczyński timelapse images). As you have noticed, the difference between the images with fixed ISO sensitivity and flexible ISO sensitivity is considerable. 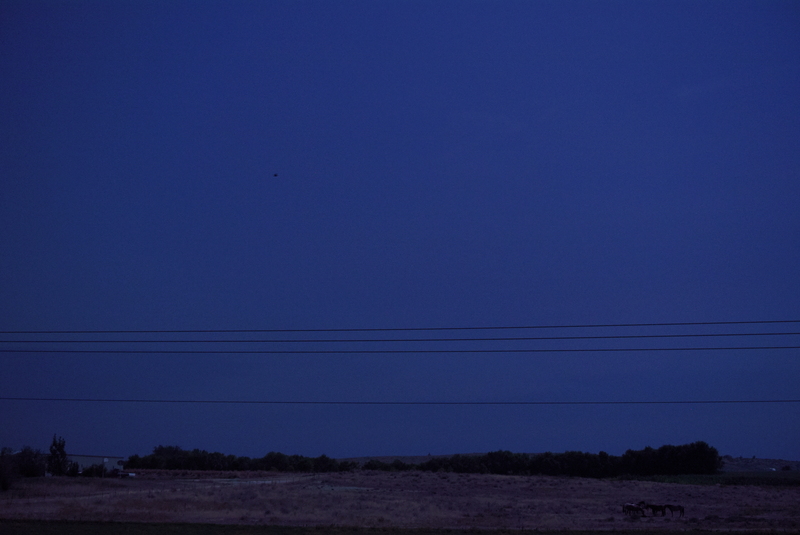 Basically upon 85% obscuration the illumination difference both the sky and the scene is quite small. This is because the camera was adapting effectively to the light level changes as well as human eye and most of camcorders does, what a good example is one of the picture above (Pic. 44), showing the changes from 90% obscuration upwards. 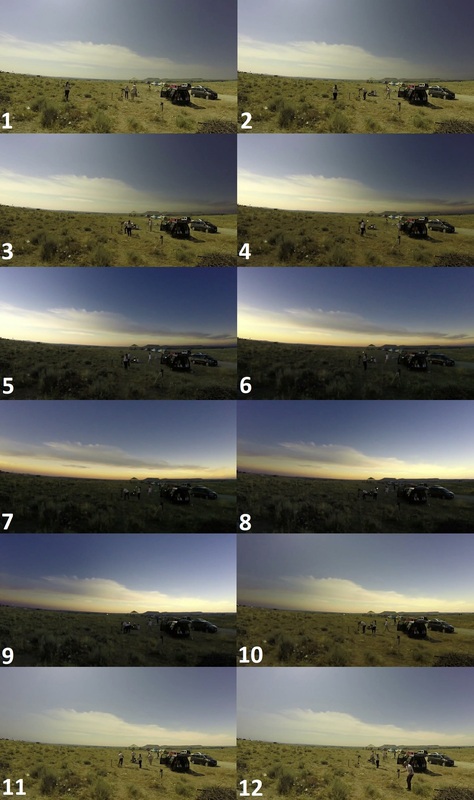 In the other hand an eagle eye can detect the illumination changes at the moment of about 50-60% obscuration, which correspond to the morning-evening sunlight condidions, whereas the cameras can detect this difference much earlier, even for 30-40% obscuration, what can be seen on the aforementioned photo sequences (Pic. 52-54). In general I have answered for all questions marked at the top of this article. Now I would like to summarize this whole esence, bringing a key things, that can be useful for all eclipse chasers in the future. Basically the lunar shadow looks like a fuzzy dark area from the space or meteorological balloon. Its edge appears also as a blur and gently “line” between illuminated and shaded area. Low level clouds, where due to the short distance to the observer the umbral edge is more fleeting. We can see the umbral edge only when is closer to horizon. Far mountain ranges, where shadow border coincides with darkening atmospheric boundary layer. 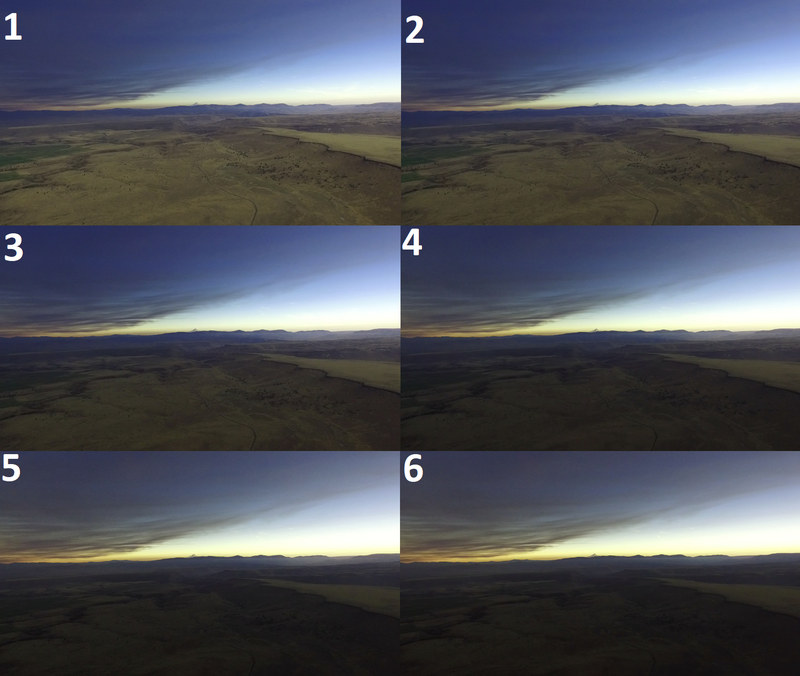 Basically is harder to distinct the border between illuminated and non-illuminated area also due to light scattering on haze and atmospheric molecules, which are tend to make the most external parts of the shadow brighter. Inside the umbra is not completely dark. This issue has been raised in previous articles. I also found, that the light level varies throughout the totality due to light scattering on aerosols in the atmosphere. The light secondly scattered on the atmospheric aerosols blurs the umbral edge, letting the scattered light going through the shadow cone. The basic, although simplified principle is, that when closer to an umbral edge then is brighter. This is clearly seen especially when looking on the shaded remote mountain ranges, where as the Moon’s shadow progress the contrast changes differently in each part of the range (Pic. 24-26). Concluding the Moon’s shadow features a gently transition between illuminated and shaded area. 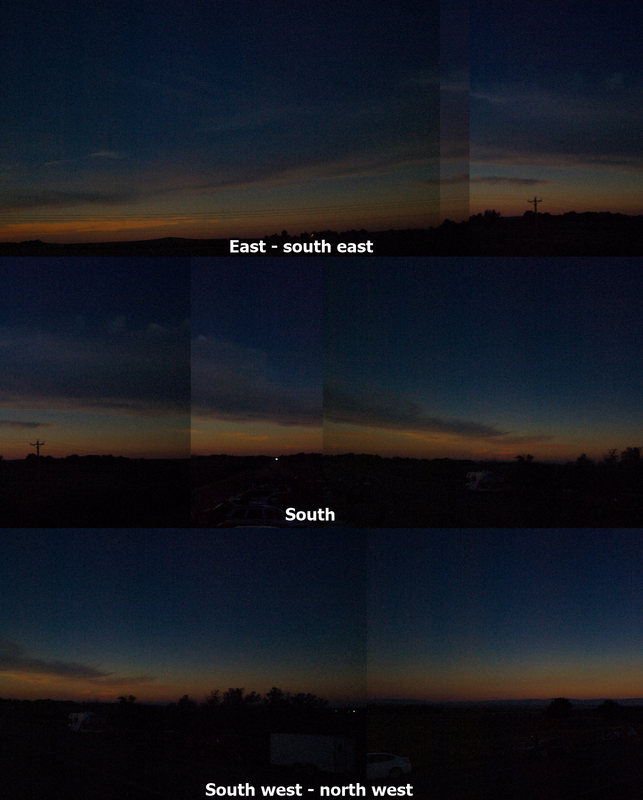 The umbral edge is not sharp, however is quite easy to spot, especially on the sky, clouds and haze. The umbral interior is nonuniform in illuminance level due to the distribution of solar light, scattered by clouds, haze and atmosphere outside the shadowed region. Comparing the extremal parts of the totality to around mid-eclipse moment the illumination difference is quite big. A prenumbral region usually doesn’t feature a lot of illumination changes in the scene unless the eclipse magnitude is considerable. It arises out of the effective eye adaptation to the new conditions. This efficient adaptation applies also to camcorders and cameras. In this event we can see a small changes of sky tint instead of diminishing the light. 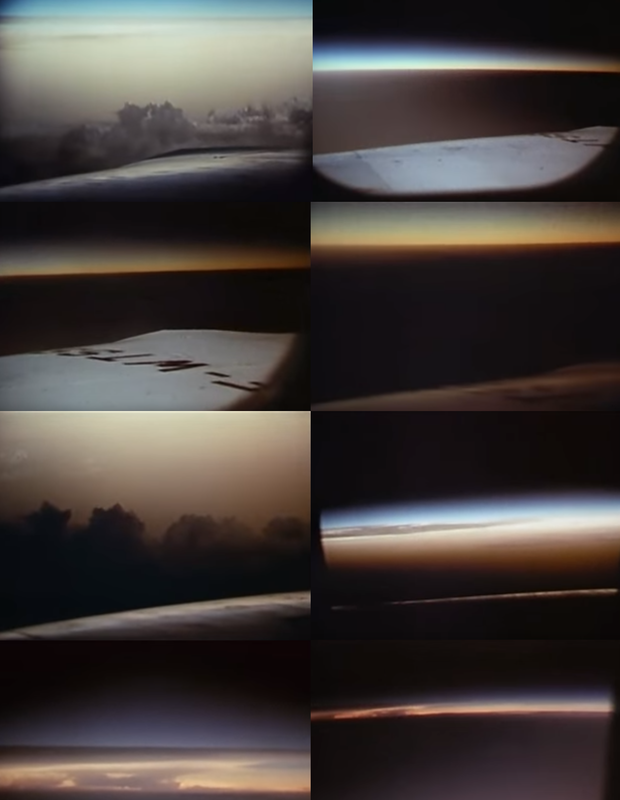 Beckman J., et al., 1973, Eclipse flight of Concorde 001, (in:) Nature – International Journal of Science, vol. 246, p. 72-74.